Over the past year, as the EU migration crisis continued to play out, I’ve had the great privilege to curate a series of research which took a close look at human smugglers themselves: who they are; how they came to be doing what they do; what they think about their work, and what it would take for them to stop facilitating the relentless movement of people. Our team of outstanding researchers sat down with smugglers and migrants in Turkey, Libya, Niger, along the North African coast including in Morocco, Tunisia and Algeria, as well as in the Horn of Africa. This was a joint project of the Global Initiative against Transnational Organised Crime and the Institute for Security Studies, funded by the Hanns Seidl Foundation. The €6billion agreement reached between the European Union (EU) and Turkey on migration achieved a dramatic drop in the number of crossings and stopped a fast-growing criminal industry in its tracks. But smugglers interviewed for this paper are watching closely for signs of a change of tack, and not without reason. The Erdogan administration has been progressively at odds with the EU as it ﬁnds itself hemmed in by growing internal dissent, multiple terror threats and a failing economy. The breathing space provided by the arrangement is running out and the EU does not seem to have a credible alternative in the event of a collapse. Read it here: Global Initiative & ISS – Breathing Space (Nov 2016). Read it here: Global Initiative & ISS – At the edge (Nov 2016). Instability and high levels of violence in Libya preclude credible interventions to stem irregular migration ﬂows from off the coast of Libya to Europe. As a result, policy-makers have increasingly been looking to the transit country of Niger in order to reduce the number of migrants crossing into southern Libya for onward travel to Europe via the Mediterranean. In Niger, international attention, premised on the assumption that European interests are congruent with those of local actors, has concentrated on the city of Agadez, a smuggling hub in the Sahara Desert. Yet, vested interests related to migrant smuggling and the free ﬂow of people in Niger are misaligned with those of Europe, and the city of Agadez is in fact part of a broader system of ethnically derived zones of protection and control embedded in the political economy of the Sahel. Interventions designed to reduce migration ﬂows and enhance protection for the migrants must be predicated on a far more nuanced understanding of local dynamics and the non-state actors facilitating the trade, so as to avoid destabilising one of the few pockets of stability in an already volatile region. This paper draws from interviews with local communities and smugglers themselves along the Niger-Libya corridor. Read it here: Global Initiative & ISS – The Niger-Libya corridor (Nov 2016). 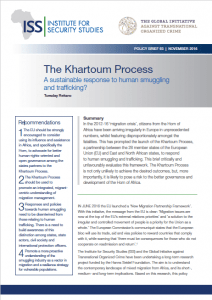 The Khartoum Process: A sustainable response to human smuggling and trafficking? In the 2012-16 ‘migration crisis’, citizens from the Horn of Africa have been arriving irregularly in Europe in unprecedented numbers, whilst featuring disproportionately amongst the fatalities. This has prompted the launch of the Khartoum Process, a partnership between the 28 member states of the European Union (EU) and East and North African states, to respond to human smuggling and trafﬁcking. This brief critically and unfavourably evaluates this framework. The Khartoum Process is not only unlikely to achieve the desired outcomes, but, more importantly, it is likely to pose a risk to the better governance and development of the Horn of Africa. Read it here: Global Initiative & ISS – The Khartoum process (Nov 2016). One further publication is due in the New Year, looking specifically at the Libyan coast. Thanks to Migrant Report for the picture, which is of detention centre for migrants in Libya. ← OP-ED: Organised crime has affected politics – but not in the way we have come to expect. Now is the time to build a new agenda.